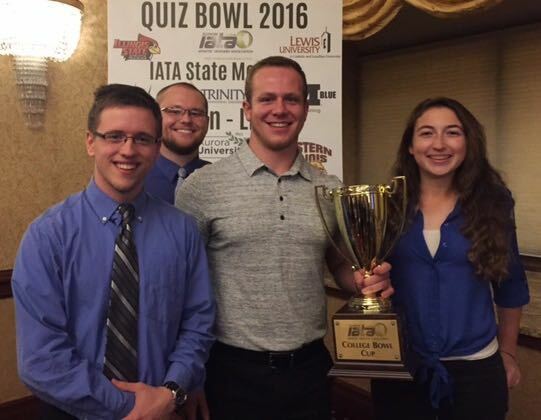 AU athletic training students (front row, left to right) Zach Wuthrich, Drew Collom, Kylie Stoneberg and (back) Marshall Basler won the 2016 Illinois Athletic Training Association’s College Quiz Bowl. AURORA, Ill. — A team of four athletic training majors at Aurora University won a decisive victory in the Illinois Athletic Training Association’s annual Quiz Bowl competition during the organization’s state convention in Lisle on Nov. 12. The Spartans competed against teams representing 12 university-level athletic training programs from across the state, including those at Northern Illinois University, Illinois State University and North Central College. They will go on to represent the state at the 2017 Great Lakes Athletic Trainers’ Association (GLATA) convention in March against teams from Indiana, Michigan, Minnesota, Ohio and Wisconsin. AU’s athletic training Quiz Bowl team members include Marshall Basler (senior; Kings, Illinois), Drew Callom (junior; Catlin, Illinois), Kylie Stoneberg (junior; Yorkville, Illinois) and Zack Wuthrich (senior; Aurora, Illinois). Oscar Krieger, associate professor of athletic training and chair of the athletic training department, is the team’s coach. The Spartans maintained a substantial lead throughout most of the Jeopardy-style contest, which comprises two rounds and a final question. The Spartans held a 2,000-point advantage going into the final question and sealed their victory by being the only team to answer it correctly. “The team performed very well and had an excellent strategy,” Krieger said, noting that their achievement reflects the general excellence of AU’s athletic training program. According to Krieger, AU athletic training graduates have maintained a 95 percent first-time pass rate on the athletic training national board exam over the past three years versus the national average of 78 percent. Over the past 2 years the first-time pass rate for AU students has been 100 percent, the highest in the state of Illinois.